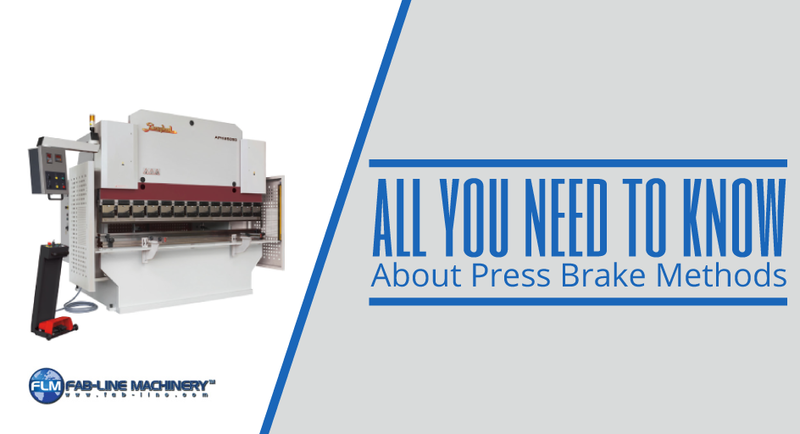 In order to understand a press brake and how it can help your fabrication efforts, you must start by learning the different ways in which they operate. While it may seem like nothing more than a bending device, press brakes are quite complex and are able to complete the job in a few different ways. All of these aspects play a role in the bending provided by a press brake, but there is not one universal bending method. These characteristics are all just components that can be used in different ways to accommodate different bending methods. Let’s start by examining the two basic types of bending: wiping and folding. Wiping – Wiping is actually faster than folding but not as precise. There is a higher risk of scratches or other minor damage when you wipe the sheet as opposed to folding it. During wiping, the sheet is clamped between the clamping beams and is then bent around the bend profile by the tool moving up and down. The tool actually moves over the sheet’s surface, resulting in the increased risk of surface damage. Panel-type projects are great for this type of bending, and with special tools wiping can be accomplished on any press brake. Folding – Folding is the best way to bend large sheets and is very easy to automate. Folding also has the benefit of a reduced chance of damaging the sheet. Folding machines are limited by space, though, due to the movement of the bend beam. Folding also requires the sheet to be clamped between the clamp beams, the bend beam rises and bends the sheet around a bend profile. Technology has allowed for folding machines to accommodate more complex projects, as bend beams can now move both upwards and downwards. Air Bending – The top tool presses the sheet into a V-shaped opening without touching the bottom of the tool. There is minimal contact with the sheet, reducing the risk of surface damage. Lack of contact with the sheet means that air bending isn’t as precise as other methods, however. Bottoming – Essentially a less-flexible version of air bending, bottoming presses the sheet against a V-shaped opening in the bottom tool, keeping air between the sheet and the bottom of the opening. The punch radius and the opening are directly linked, so every angle requires a separate tool set. Bottoming is much more accurate than air bending, but is quickly becoming a secondary option. Coining – The top tool presses the sheet into the opening of the bottom tool into the V-shaped opening. Coining requires a great deal more force to achieve the desired bend, but is very accurate and precise. Three-Point Bending – New to the bending world, three-point bending is a close relative of air bending. By using a special die where the height of the bottom tool can be accurately adjusted, the sheet bends of the bend radii of the die until it makes contact with the bottom. Those are all the basic types and variations of bending that you can achieve with a press brake. If you are looking to add a press brake to your fabrication floor, contact Fab-Line Machinery today.